It’s official. The Bollywood film my sister is acting in has been named. It’s called Love Songs and it will also feature industry stalwarts like Jaya Bachhan and Om Puri. Sis has been busy perfecting her dance moves on the streets of Calcutta, in full costume, the entire weekend. What a role model! My little sister, I mean. To follow on from my previous post on two ways to cook potato and cauliflower curry. We’ve covered aloo gobi, the popular Punjabi version. Here is the Bengali version, which is eaten as a light curry with rice. Heat the oil and fry the bay leaf, until it starts sizzling. Then fry the onions until translucent. Throw in the potatoes, all the powders apart from the garam masala, add half a cup of water, cover the pot and cook the potatoes. When the potatoes are almost cooked (you will be able to insert a fork into the potatoes with some difficulty), add in the cauliflower and the tomatoes. Cover the pot and cook until the cauliflowers become soft and a fork can be inserted into them easily. Add salt and sprinkle garam masala and fresh coriander to finish. This dish should be served with a light curry base, ideally with some rice. I found your blog through a link on Hooked On Heat and thoroughly enjoyed reading through your posts. I tried your Saag Aloo recipe and posted about it. It was pretty easy to make and tasted good. Thanks for sharing the recipe. I’m going to have to try some of your other recipes. I also found your link through Hooked on Heat. I feel a little intimidated about cooking Indian food, but you make it look very easy. These cauliflower recipes look delicious. I will definitely come back and see what else you’re cooking and try making some of them. Hey..on a different tangent here, I have sent you an email and it might be stuck in your spam folder. Kindly pls do check and reply when free. Great to have some new bloggers on site. Mandira – You are actually supposed to fry them before you add them to the curry. But this is quick Indian cooking so it saves time to add them in directly. Also, I am fairly fat conscious and don’t like pre-frying before frying as it were. Try my version next time and see what you think. Thank you, Thank you, Thank you! 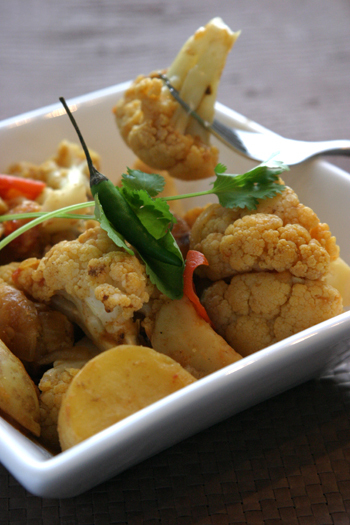 Not one, but two wonderful aloo gobi recipes and you were so sweet to email and let me know they were there! My mother arrives for a visit in two weeks – plenty of time to try these out and wow her. Hubby thanks you dearly too. He’s finally getting the yummy Indian cooking he thought he’d get by marrying a Bengali gal. Can’t wait to see Love songs on B4U!! I am excited. Wow! My favorite dish. I absolutely love cauliflower. Do not watch too much Bollywood, but have to watch your sister’s movie. Looks fantastic Mallika! I need an excuse to make garam masala to have on hand so when I yodle out an “ALOO…..” (instead of yahoo or waahoo) folks round these parts know what I’m up to. Congrats to the sis, keep up the fantastic work yourself. Just came across your site today. I am a desi living in China now. I only know how to make only 2 or 3 indian dishes so I am looking forward to giving some of your a whirl. Mahalo. onions? right at the start, before bay leaf, right? Hi – Found your blog from the Trini Gourmet. Love your pictures. And the recipes of course. Hi Mangs – No, bay leaf always goes first so it can fry in the hot oil before you add the rest of the ingredients. Great to have some new blog buddies. Hope you guys try the recipes and give me a shout. This is the best article I have ever found on the Internet.Iike pandora bracelets jewelry. Yes! Finally something about google rank checker. I must say that you’ve done a amazing job with this. In addition, the blog loads very fast for me on Opera. My spouse and i felt excited Ervin managed to deal with his survey out of the ideas he acquired in your site. It is now and again perplexing to just happen to be freely giving instructions which other people could have been selling. We really see we’ve got you to be grateful to because of that. All of the explanations you made, the easy web site menu, the friendships you can give support to create it’s many remarkable, and it’s really making our son in addition to the family feel that that concept is awesome, and that’s pretty indispensable. Thank you for all the pieces!